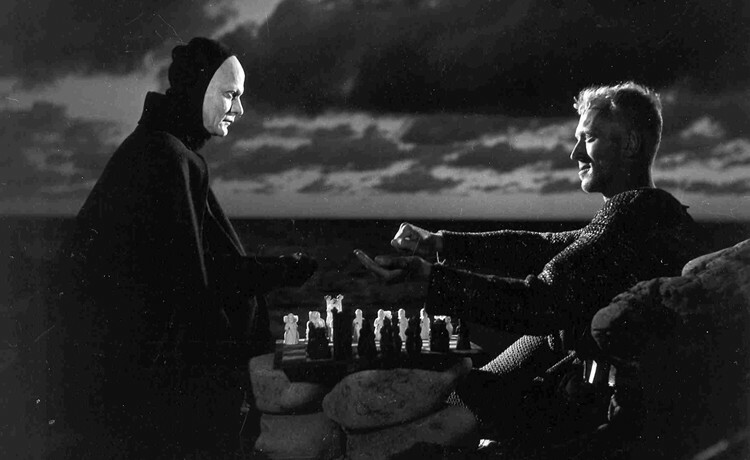 A knight plays chess with Death as a bird of prey circles overhead. He has come back from the Crusades to a land ravaged by plague and in chaotic disarray. There is a troupe of travelling actors who perform carnival plays and sing bawdy songs. A procession of priests and penitents interrupt them, holding a pole with the crucified Christ aloft. Carrion souls steal from the dead. In a tavern, one of the actors is bullied and humiliated and mocked. It is a capricious, xenophobic world full of casual cruelty and enervating foreboding. Yet it is solemn and mysterious too, where the best bet against oblivion is faith in the legend of the man who said he was the Son of God. It is clear that Roger Corman took much from this film when he made The Masque of the Red Death. They are very different films, that is true, but there is the same medieval world. Why, even the main actors in each, Max von Sydow and Vincent Price, have a similar screen presence. Both are tall and imposing with wonderful voices. This must-see classic has a prismatic cast: Harvey Keitel, Romy Schneider, Harry Dean Stanton, Max von Sydow… not to mention the city of Glasgow itself. And that’s not all. It is curiously prescient in predicting the wanderweg that television has now taken, its obsession with sensationalism and ersatz intimacy, what is commonly called reality TV. Will we in time see someone die on live TV? That’s the prospect in store here. Our heroine (Romy Schneider) has been told that she has a terminal illness, and the producer of a programme named Death Watch (Harry Dean Stanton) is tracking her. He is determined to make her death (contra Wittgenstein) an event in the world. The end of the film, coming about through a telling disclosure and a final defiant act, is perhaps a little too pat. But there are some effective moments of unease and uncanniness before then, such as only present day sci-fi can give. The cinematic pinnacle of the genre is probably Mark Romanek’s adaptation of Kazuo Ishiguro’s Never Let Me Go, but at its best this film scales similar heights. Death Watch is showing again on Wednesday as part of the Matinee Classics season, further details are here.